This month gave us a mixed pile of issues. 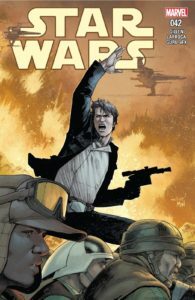 While the “Ashes of Jedha” arc in Star Wars is a major high point other comics like Doctor Aphra and Poe Dameron fall on the lower end of quality. Despite that, this was a good month overall and many of these books are well worth reading. Star Wars 41-42: The Jedha arc moves forward with some great moments. Things start to get heated up with the rebel forces taking on the nearly unstoppable mega mining craft while Luke sees the corruption of the dark side first hand. The battle gets bigger in issue 42 with each one of the main heroes having a good part in the plan. The writing is great with some fun one-liners, nice nods to Rogue One, and Han getting some character development. Sadly, the art is a bit of a mess. The standard issue of the odd mix of hyper realistic faces combined with the ‘normal’ comic designs of everyone else still sticks out like a sore thumb. Worse yet, in issue 42 the backgrounds are either near gradient or look like someone spilled ink on the page. Despite the visual missteps this is a good book and this arc has been one of the best in a long time. Darth Vader 10: The Dying Light arc comes to an end with a few welcomed surprises. 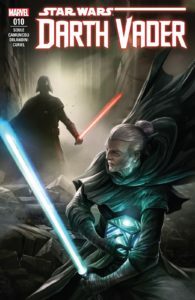 The story picks up where the last issue ended with Jocasta battling Darth Vader and the battle takes them to the streets of the city and hits some emotional places as well. The writing benefits from the ‘less is more’ model that this series has had thus far. The ending has some great moments that may lead into another story down the road. The art is average, with the fight looking pretty good, but sometimes movement doesn’t make sense. Backgrounds and facial expressions seem to be improved over previous issues. While this run of Darth Vader (Soule, 2017) has its problems it is still worth reading if you want to see more of the Rogue One kill ‘em all Darth Vader. 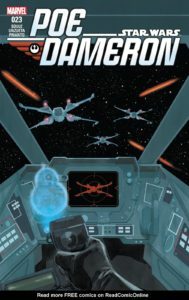 Poe Dameron 23: The stupid ending of the previous issue brings us into a battle with Commander Malarus of the First Order (AKA Pearl from MST3K) attacking Black Squadron while Terex starts up a plan of his own. This issue feels rather dry and empty. There is nothing that happens that can be predicted from page one and this just feels like filler to maximize the arc length. 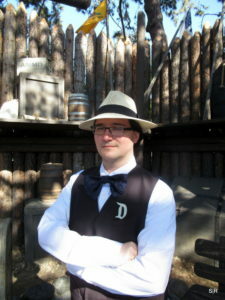 The writing is fine, but forgettable. The art has the same ugly faces as before and the battles still feel static. This series is overall rather bad, but when this arc ends it will have caught up with The Force Awakens. Sadly, that won’t be the end, instead we get an arc about what happened to Poe after the crash. Despite another six months of this comic it will hopefully end this year. 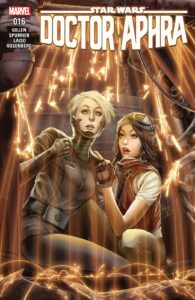 Doctor Aphra 16: This might actually be the worst issue of this series so far. The story is nothing special with Aphra’s team trying to get the information Triple-Zero wants, but then face off with the Empire and a monster. However, the execution of this is all wonked up. The scene shifts are abrupt, moments of action aren’t explained and the art does not clarify the scene, and the tone is all over the place. This goes from dark humor, to action to drama to bad humor to romance in a whirlwind of bad. Two writers is clearly not helping this series. Despite the talents of both this collaboration just ruins the product. The art makes a bad script even worse. When discussions on forums exist to explain or figure out what was going on then you know there is a major issue with this book. It seems like Emilio Laiso put all his effort into drawing one kiss that he didn’t have enough time/effort to make the rest of the book look good. 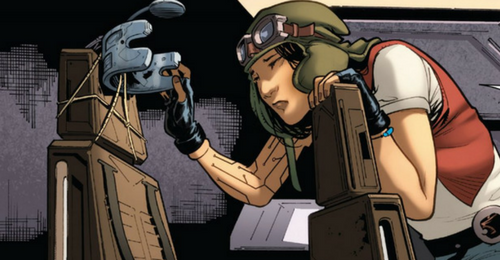 Beyond that the relationship between Aphra and Tolvan feels forced and pandering. Any of the subtly of this book has gone out the window and the series is suffering because of it. Hopefully things can turn around as this is one of my favorite of the new canon comics, but it feels like it’s going to continue to go downhill until this arc ends. 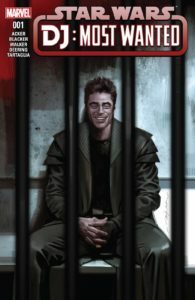 DJ- Most Wanted #1: This one-shot is done by the same creative team as the previous tie-in book (The Storms of Crait) and tells another mostly pointless story. DJ finds himself getting in trouble with a casino during a con job that leads him to a chase through the city. You learn a little bit more about the character, but it doesn’t add up to much. The writing is fine, possibly better than the previous book the team worked on. The art is a marked improvement from the previous book with everyone looking much more on point. Overall this is a better book than the Crait book, but it won’t add much to your Last Jedi experience.